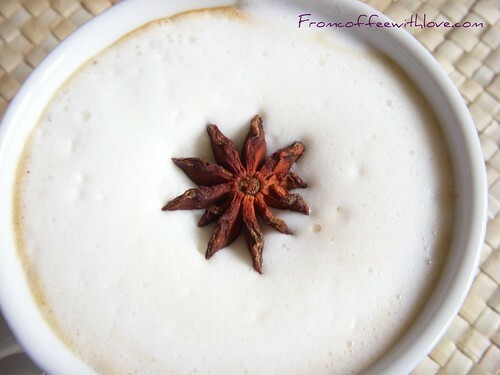 I call this Haute Couture Cappuccino, because as you sip the cappuccino, the proximity of the star anise to your nose sends a lovely smell up your nose into your taste buds without you actually drinking the star anise itself. One for my cafe if I ever open one God willing. Also, I made this silky smooth frothed milk using a Bodum milk frother for all those who doubt you can’t get microfoam with a basic milk frother. Enjoy the pic. This entry was posted on Tuesday, January 15th, 2008 at 11:58 am	and posted in The Art of Coffee. You can follow any responses to this entry through the RSS 2.0 feed. Was this a manual Bodum frother or the battery powered one ? I want to get a milk frother and would love to know which one you used ! You are the first person to comment on my website – thanks. I used a manual Bodum Frother, which are not expensive. Just pour fresh cold milk up to the maximum point on the jug, place on the stove on fairly high heat, monitor for about 2 minutes until you begin to see a bit steam and the jug is hot to touch (you don’t want it to start bubbling) and push the frother up and down the jug very fast and you’ll have nicely frothed milk. It won’t be as good or as fine as the experts using the steam wand on a espresso machine but it is still nice. Good luck !